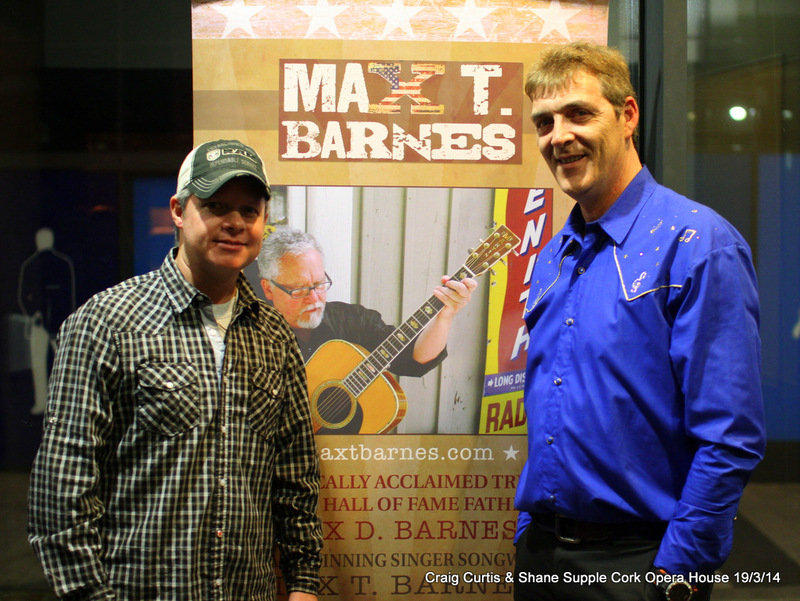 On March 19th 2014 , Shane Supple gets to open for the legendary country songwriters Max T Barnes & Craig Curtis on the Cork Opera House stage. 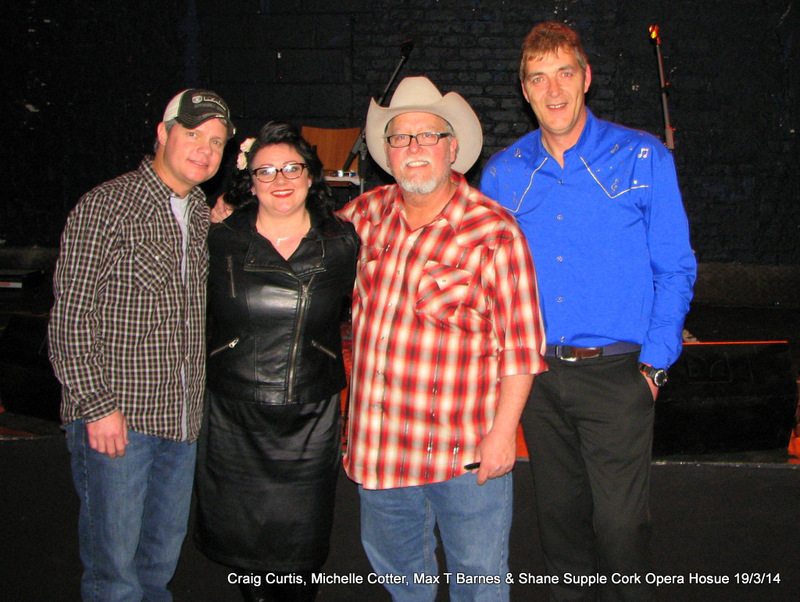 Max T, who has written countless hits for many of Shane’s idols, (Collin Raye, George Jones, Gene Watson, Randy Travis, Diamond Rio, Joe Diffee & Vince Gill among others) contacted Shane during the year to ask him to take part in the show. We were talking for ages, he was calling me from Nashville and I was going through different songs he had written and he said to me that he liked my own song Lifetime Guarantee which he had heard on a radio station while touring Ireland last year. Of Course I said yes, who wouldn’t. So I am really looking forward to that. 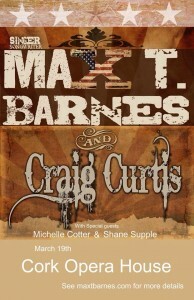 Max who will be touring with american songwriter Craig T Curtis will be in the Cork Opera House on March 19th. Also joining the lads on the bill is local singer Michelle Cotter who is currently appearing on TG4 search for a star, Michelle is a daughter of bass player John Cotter a long time friend and band mate of Shane’s. Its great to see Shsane keeping such fine company. Tickets are available on the Cork opera House website for this great night. 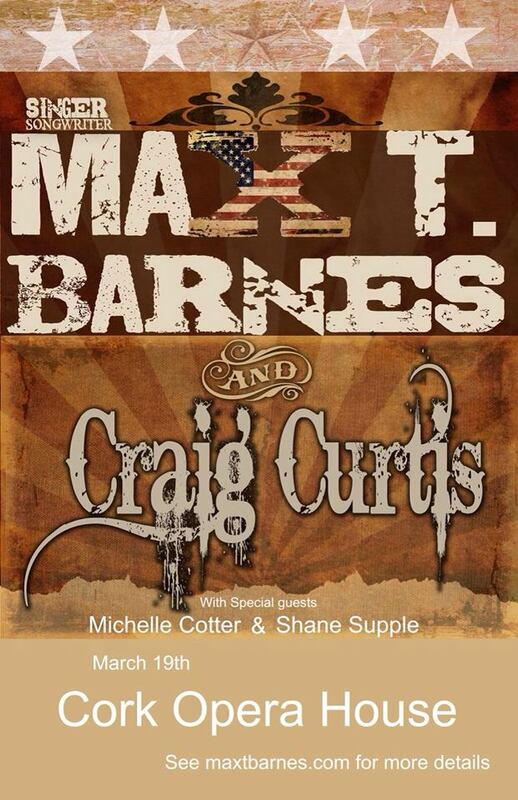 Max T. Barnes wrote his first hit song at the age of 19, Vern Gosdin’s “Way Down Deep“. He’s been topping the charts ever since. Writing “Let Go of the Stone” by John Anderson “At the Sound of the Tone” by Dukes of Hazard’s John Schneider and “Before You Kill Us All” by Randy Travis.3 Weeks at #1 with “That’s How Your Love Makes Me Feel” by Diamond Rio – and 3 Weeks at #1 with “Love, Me” by Colin Raye. Further credits include the complete score to “A Letter From Death Row” for HBO starring Martin Sheen and Charlie Sheen. That’s nine #1’s and hits, and dozens of album cuts with album sales nearing 20 million. “Love, Me”, the career launching hit For Colin Raye also took Max T. to the CMA awards as a CMA “Song of the Year” Nominee. But Max T did not win it that time around. 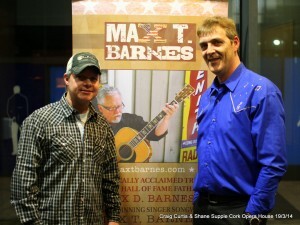 Among other greats, he was up against his dad, legendary songwriter and Hall of Fame member, the late Max D. Barnes. His father took home the award that night with “Look at Us”, a co-write with Vince Gill. “My poor mom didn’t know who to root for.” Max T. remembers. “I am proud to have been a part of the only father/son competition in CMA history.” His father, Max D., had also won in 1989 with “Chiseled in Stone”. Max has been a staff writer and producer in Nashville for nearly thirty years working under contract for Sony, Warner Brothers, PolyGram, MCA, Island Bound, Curb and Ray Stevens. Early on however he also played lead guitar touring with Bobby Bare, Shelly West, Joe Sun, Linda Davis and Tanya Tucker to name a few. He did tours with Reba, Garth Brooks, The Judd’s, Merle Haggard, George Jones and too many more to mention. His songwriting credits range from Ralph Stanley to Montgomery Gentry. Poison to George Jones. Among his latest singles were two Joe Diffie hits, “A Night to Remember” and “Tougher Than Nails” as well as the title song and single from the Billboard #4 Comedy album, “We The People” by Ray Stevens. Max T. has Had songs recorded by: John Anderson, Collin Raye, George Jones, Gene Watson, Randy Travis, Diamond Rio, Joe Diffee, Jodee Messina, Trace Atkins, Mark Wills, Alabama, Montgomery Gentry, Ray Stevens, Billie Joe Royal, The Marie Sisters, Jeff Carson, Hank Cochran, Rhett Akins, Daryl Singletary, John and Audry Wiggins, John Shcnieder, Ralph Stanley, Linda Davis, Joe Sun, Vern Gosdin, Skip Ewing, James Bonamy, Billy Dean.